Yesterday afternoon, when Congressman Dave Loebsack announced his retirement beginning at the end of the 116th Congress, the reality of it hit home. Dave and I briefly discussed retirement, his and mine, over the last couple of years. He talked with everyone he met about almost anything. Last summer it became clear his days as a U.S. Congressman were numbered. I posted about it here. To put the date Jan. 3, 2021 on it brings to a conclusion an important part of my political life. Few political events changed me as much as the Nov. 7, 2006 general election which repudiated the George W. Bush administration, changed the tone in Washington and Iowa, and paved the way for Democrats to elect Barack Obama president two years later. That’s not to say Republicans didn’t become energized. With losses in 2006 and 2008, and after the Patient Protection and Affordable Care Act was signed into law March 23, 2010, they came back. Republicans successfully pushed back the Democratic tide and re-elected Terry Branstad who went on to become the longest-serving governor in U.S. history. Under the leadership of Jeff Kaufmann, who became chair of the Republican Party of Iowa in June 2014, Republicans built a political machine that’s proven hard to beat. 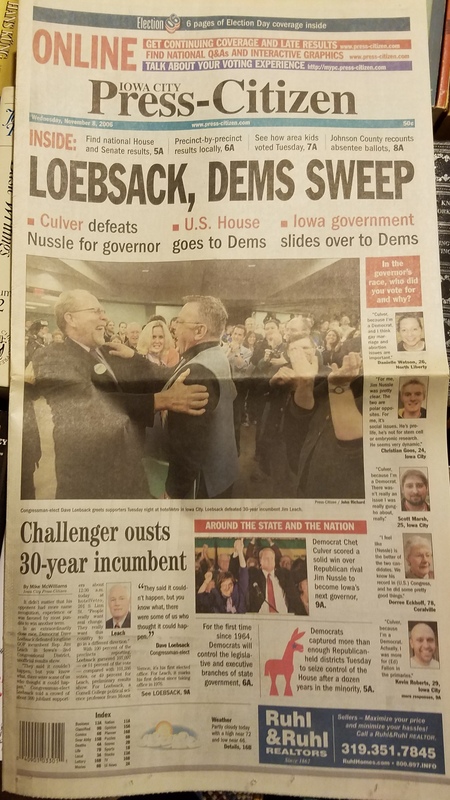 Through all of this, Dave Loebsack persisted, continued to win re-election, and remains undefeated. Within hours of the press release, people were thanking Loebsack on social media, with some already moving on to the topic of the horse race to replace him. Four names raised yesterday are worth discussing. If Rita Hart is interested in running for Congress, she could likely win the June 2, 2020 Democratic primary election. As our candidate for lieutenant governor in 2018, she campaigned throughout the state, including the second congressional district. This experience, and her contact list of district Democrats with whom she has worked, gives her a leg up in fund raising, gaining support, and experience to focus on what matters most in a campaign. She served as state senator in Senate District 49 before accepting a position as Fred Hubbell’s running mate. The Republican Party of Iowa will need new blood if they hope to be competitive in the district, rated a toss up by the Cook Political Report without Loebsack in the race. Three-time loser Mariannette Miller-Meeks (R-Ottumwa) went on to become a state senator in District 41. When contacted by Murphy, she said she would give the matter of running consideration. Murphy also contacted two-time loser Christopher Peters (D-Coralville) on vacation in Italy. Peters deferred comment until he returns to Iowa. In an open seat, Republicans would be foolish to run one of these two repeat candidates. The other non-Jim Leach opponent over the years? I met John Archer (R-Bettendorf) in Tipton in 2012 and felt creepy for a couple of days afterward. I doubt he’s interested, and Jeff Kaufmann would likely stop him from running again if he were. My state senator Zach Wahls gets mentioned a lot as a potential replacement for Loebsack. Few politicians have as bright a future ahead of them as Wahls appears to. I’m not privy to his plans, although I spend a little time with him at political events like I did with his predecessor, Bob Dvorsky. If one follows Wahls via legislative newsletter, on Medium, on Facebook and Twitter, it is clear he is learning the ropes of being a politician. He has political credibility, beating three opponents in the June 5, 2018 Democratic primary election with 63 percent of votes cast. Janice Weiner ran a serious primary campaign against Wahls, garnering 32 percent. Eric Dirth and Imad Youssif were on the ballot, but not competitive. I know Tessler only by name and that because of watching her North Liberty operation of Yotopia, Iowa City’s Original Froyo, open then shutter on Pacha Parkway as I drove by to retail jobs in Coralville over the last few years. The Iowa City location has been successful, having opened in 2011. The single time I stopped at the Clinton Street location, I had a frozen yogurt with Carsner. The snack was efficiently delivered and tasty. 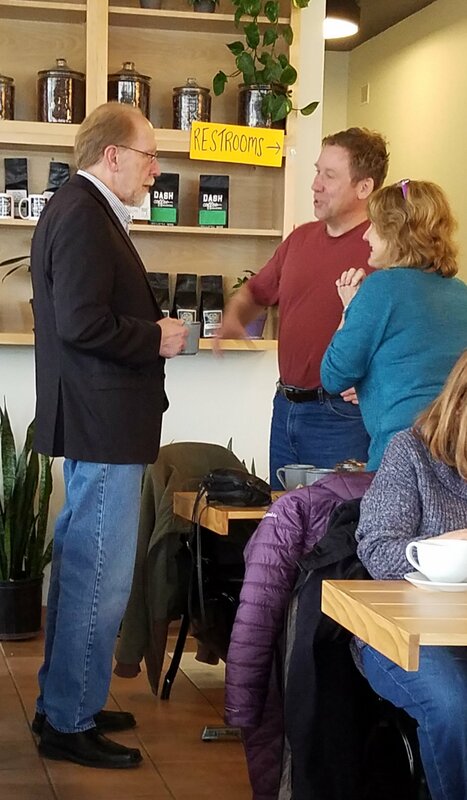 Congressman Dave Loebsack chatting with constituents at Dodge Street Coffee, Iowa City on March 9, 2019. I was an early adopter of Gmail with records going back to 2006. I searched for Veronica Tessler and came back with 23 distinct hits dating back to when she was a delegate to the 2008 Second District Convention. A google search shows plenty of activity, including support for an Iowa City gun violence protest where she was quoted in a March 31 Cedar Rapids Gazette article. If she announces for Congress, some of that may become relevant. Other potential candidates have been mentioned in social media since Loebsack’s announcement. Right now, I’m processing what Dave’s departure from the Congress will mean personally and to the district. Loebsack did constituents a favor by timing retirement so there would be an open seat. I expect that if the four mentioned candidates jump into the race, more will follow. Dave Loebsack has been a dependable part of my life since I first started our dialogue via email in 2005. Seems like I should be saying something besides Woody Guthrie’s line, “So long it’s been good to know ya,” but that’s what I have for now. 2 Responses to So Long Dave, It’s Been Good to Know Ya! Sorry, I can’t ‘like’ this post. Not news I wanted to hear.